The Omega™ 3000 is the most basic cleaning module. 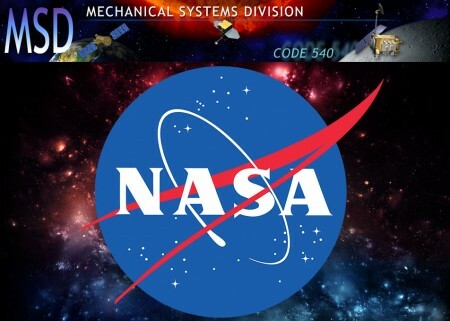 It only runs on two channels, but supports up to four nozzles. 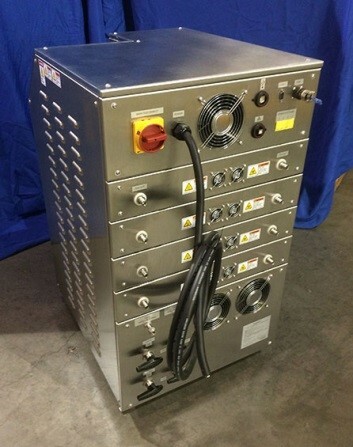 This module can easily integrate into any cleaning process. For maximum efficiency, more nozzles make it much easier to clean at different locations and at different angles. Easy to retrofit onto existing automation lines, this module was built for versatility. Even the installation process is streamlined – there is just one single I/O connector on the rear that needs to be plugged in before use. Additionally it can be fixed with a parking garage – Cool Clean’s add-on for measuring optimum temperature and spray parameters. 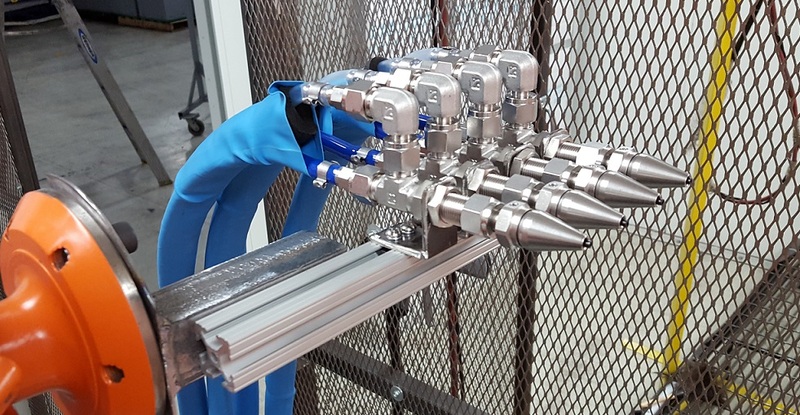 The Omega™ 3000 is very flexible and cost effective, which makes it perfect for preexisting production lines, currently featured in cleaning for automotive lines prior to painting and coating. 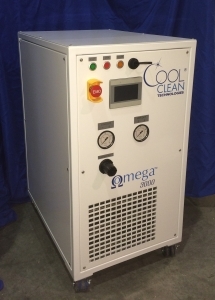 The Standard Omega™ cleaning module is the 4000. This workhorse runs on two or four channels, connecting up to 4 nozzles, for a thorough cleaning of any surface with CO2 integrated spray. 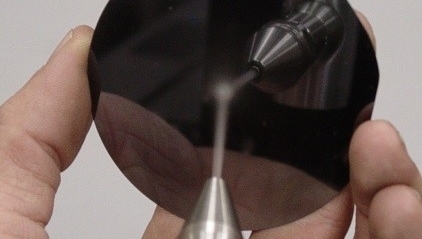 Particles on various surfaces can be successfully and efficiently removed by simply blasting crystals of CO2. Liquid CO2, which is a residue-free solvent, can remove even the thinnest layer of contamination from the surfaces being worked on. Configures with automation end effectors and uses remote communication for monitoring system parameters. 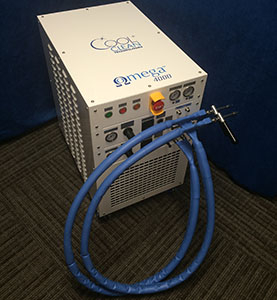 The Omega™ 4000 comes in either a powder coated enclosure or stainless steel option. As the name suggests, this module allows you to take the cleaning where it’s needed most. The MobileClean™ and refill station allows for cleaning that is both selective and powerful at the same time. 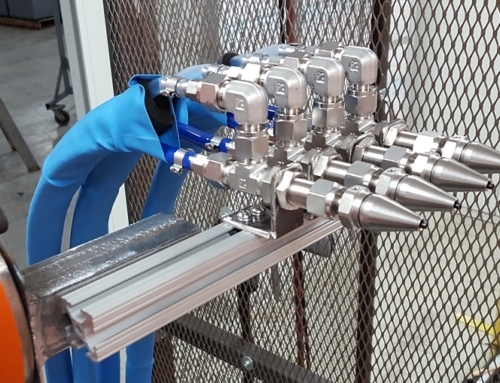 Also called the Omega™ 5000/7000, this powerful tool allows for adjustments to the impact velocity and hardness of the CO2 crystals ejected from the spray. It is a simple plug and use, wand shaped spray that also comes with a HEPA filter. Refill station enables a supply of liquid CO2 to be at hand while engaging in the cleaning operation. 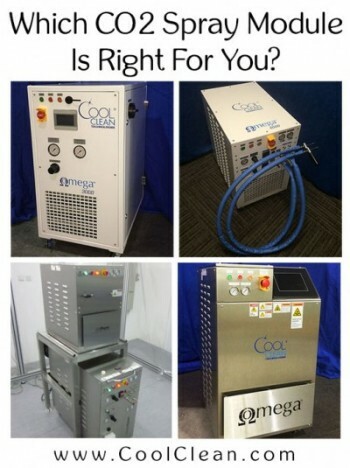 The expert module of CO2 cleaning is the Omega™ 8000. Similar to the other modules, it converts liquid CO2 into a solid before spraying it out for precision cleaning. Designed to operate with four nozzles, each individually monitored and controlled. The Omega™ 8000 filters and condenses CO2 and adjusts the spray conditions for optimal efficiency during use. It’s sleek, stainless steel body ensures the module is ultra-durable. Lastly, it can be configured with SmartSpray™, a program that automatically adjusts the spray to optimum user defined spray conditions. The system can be a standalone cleaning unit or operate on turn-key for automation. Picking a module from any of these four modules depends on the intended use. 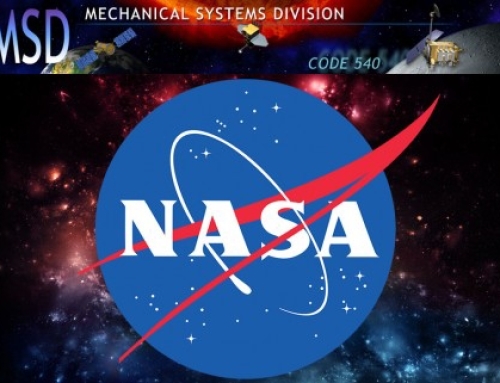 Each system offers different features that with their own unique set of advantages. If you’d like to learn more, give us a call or drop us a line – we’ll take the time to learn all about your specific needs so we can recommend the CO2 cleaning spray module that’s right for you.